(post from a blog circle called "a letter to my son". This last month has left my head spinning! It puts things into perspective when you realize that you haven't taken a "big" camera picture of YOUR child in months when you have to do a last minute blog post! I focus so much on making beautiful images for everyone else, that my family gets the back burner. If anyone has the magic recipe for the balance of life, I would love to make a copy of it. I am sorry that your post has all iphone pictures. I actually took a couple pictures of you in your high chair this morning, but I decided to use the snapshots that I have compiled over the last month instead. You LOVE your "Ah-eeee" (Zoe) She always comes and lays in your lap for you to pet her!This month you have learned to eat big bites of food without it being cut up! I am so proud of you! 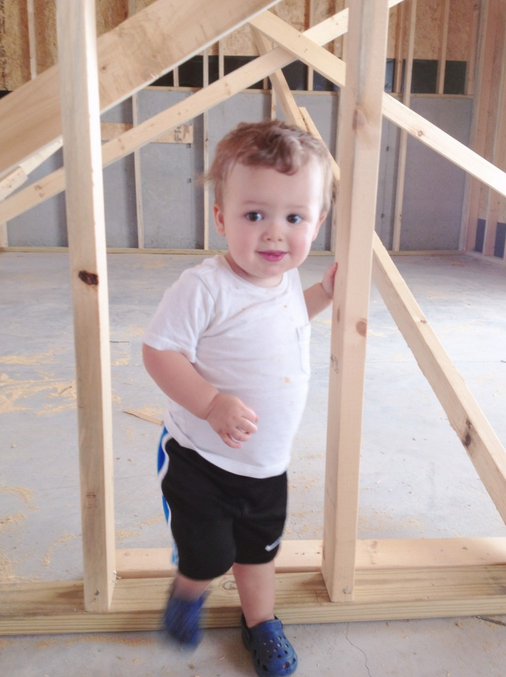 We have been playing at the new house a lot, so you like to climb in between the walls and jump over the wood! You are going to be sad soon when those walls are closed up! Every time we leave the house, you cry because you just love it so much!You are a mama's boy. You LOVE your mama! I cry thinking about you having to leave for college one day. Yeah, I am THAT mom! I just can't even deal. You are so precious! This month you have learned to back up and sit on everything! (Kind of behind on that milestone I think) Going up and down steps have officially been mastered as well! It still gives me a heart attack though! We have been playing outside a lot this summer! It has been so mild! You love drawing chalk on EVERYTHING, driving your car, playing with magnets on your board, water table, playing with the neighbor's cats, playing with daddy's "b-ball", and dancing to the "Aye-de-oh" (radio), every time we walk into the garage!You have had fiesty little attitudes lately. It makes me dread giving up paci! AH!Daddy built this fire truck for church, and you were the honorary first slide! Too bad you can't really slide very well! HA!Your other bff. "Mr. Kitty" from next door!We got to go to the zoo with daddy last week and you rode the carrousel for the very first time! You were not crazy about actually riding it, so daddy sat down with you! I have always called you the animal whisperer because they just love you. 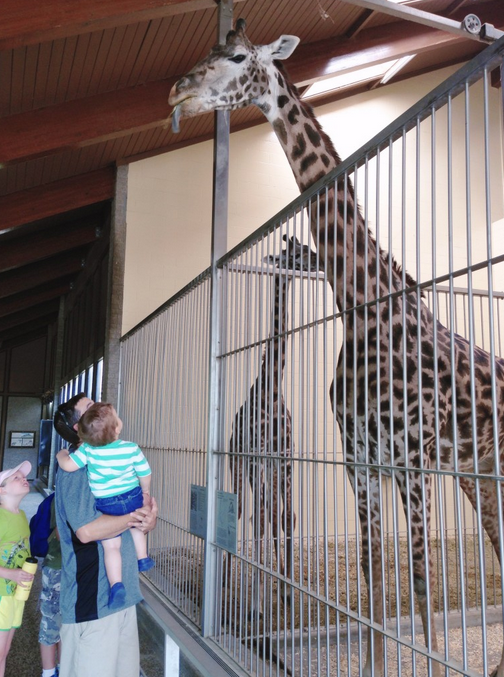 When we went to the zoo, the giraffe was at the back of the indoor room eating, and walked right up to you and put his head down as far as he could! I think they can sense your sweet nature! I am also loving how you like to try and sing Twinkle Twinkle Little Star, the ABCs, and Old McDonald! It is precious listening to you sing! I also love your new phrases! This is such a fun age! You keep us on your toes! We love each crazy day with you!